When Indianapolis Archbishop Charles C. Thompson thanked Los Angeles Archbishop José H. Gomez for celebrating the closing Mass of the National Catholic Youth Conference (NCYC) on Nov. 18, a cheer broke out from the Los Angeles youths in attendance. And when he mentioned the United States Conference of Catholic Bishops meeting in Baltimore, that archdiocese’s contingent of teens shouted and clapped. He proceeded to receive shouts and standing ovations when he thanked the National Federation of Catholic Youth Ministers, and then when he thanked the Archdiocese of Indianapolis, and then when he thanked all of the religious, deacons, priests and bishops who helped with NCYC…and then when he wished everyone safe travels. He just shook his head and laughed. “A guy going to a Catholic wedding told me he didn’t know if he should wear a dress suit or a warmup suit because Catholics stand up and sit down so much!” he joked. And that line too received a thunderous standing ovation. 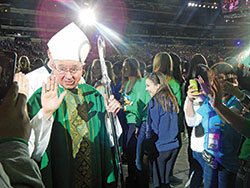 It was the kind of spirited joy that only 20,000 youths could exude at the end of the three-day NCYC gathering. Not long before the revelry, the very same youths had knelt in solemn prayer after receiving the most holy Eucharist during the convention’s closing Mass in Lucas Oil Stadium in Indianapolis. Thirteen bishops, including Archbishop Thompson, concelebrated the Mass with its primary celebrant, Archbishop Gomez, who wove into his homily another auspicious Catholic event that happened earlier that day. But that is not why the Capuchin Franciscan was beatified, said the archbishop. Rather, he was beatified “because he tried to serve God in every moment. … He used his gifts to help others. “Try to do little things for God. Try to be a little miracle in someone’s life. Give hope. Such was the message of the day’s Gospel reading from Matthew, he said of the parable of the servants and the talents. The archbishop gave specific advice to help the youths do God’s will and to become holy: “The most important thing … is to pray,” he said. “When I was your age, I made a decision … to spend some time in prayer daily, and it has made an extra difference in my life. Elizabeth Murillo of the Diocese of Dallas, who attended NCYC for the first time, experienced such a moment earlier during the conference. “One of the things that stood out to me is that someone said to let God speak to me, and [God] said to me, ‘You’re not alone, you have me. You can count on me anytime you want,’ ” she recalled. 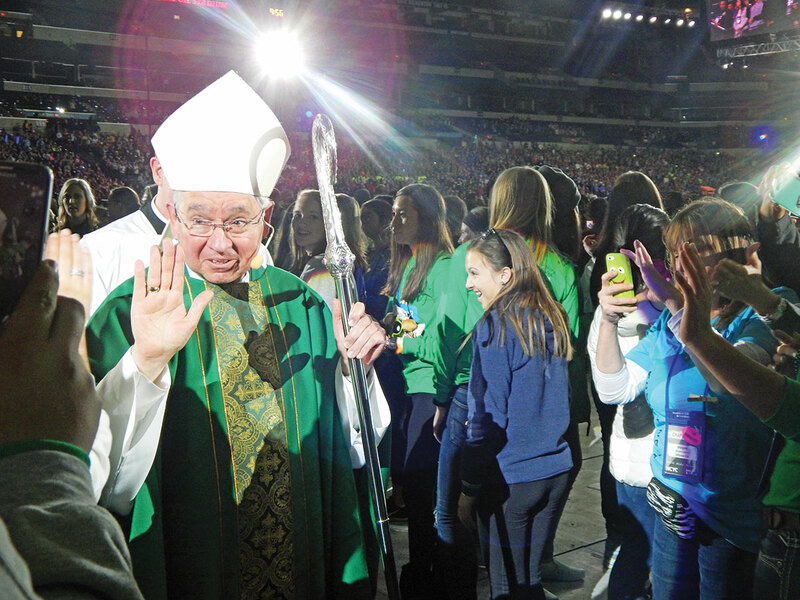 Several youths cited the time adoring the Blessed Sacrament as a group of 20,000 teens on Nov. 17 in the stadium as the most impactful moment of NCYC. Daniel Linn of St. John the Evangelist Parish in Indianapolis agreed. “I’ve never celebrated it that way before, with so many people being so sacred,” he said. Based on a comment he made in his homily, it would seem that Archbishop Gomez agrees.